Several years ago I took a group of teens through my discipleship booklet. In the first lesson I quoted Colossians 2:6-7 and used it as a foundation for our studies. I explained to them the importance of building a firm foundation for our lives in Christ. I am excited to say the message and the discipleship booklet studies we did really sunk in and deep roots were formed. If you would like to use the free booklet you can find it here – https://passionaustralia.org/DiscipleshipBooklet.pdf. Psalm 82:3-4 NLT – “Give justice to the poor and the orphan; uphold the rights of the oppressed and the destitute. Rescue the poor and helpless; deliver them from the grasp of evil people. God wants us to look after and protect the most vulnerable members of society. He wants us to look after the poor, the helpless, the orphans and widows. These are people that are easily taken advantage of by evil people. What can you do to help the poor, the orphan, the helpless and the widow today? All of these organisations help the most venerable in our world. Now before I go on I want to explain read / listened to. My wife had a paper back copy which she read, and I bought the audio version. So I listened to Francis read and I followed along. Now this book gave me lots of mixed emotions. At times I loved it. At other time I am not sure if I agreed with him. And other times I felt convicted. However, in the end I would say I loved it. For me personally I would say this book effected me in four ways. 1. It reminded me – in the first few chapters it reminded me about God and myself. 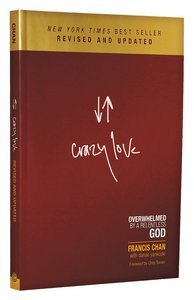 The first few chapters (1-3) Stop Praying, You might not finish this chapter and Crazy love reminded me of an amazing God who loves me and holds my life and eternity in His hands. It reminded me that my life is not just about me, but about God and my neighbour. 2. It convicted me – the next chapters (4-7) looked at a profile of the lukewarm and offering leftovers to God and more. This had lots of Scripture that really hit the bone. We all have lukewarm areas in our lives and this section pinpointed some for me. It finished with a call to remember our best life will come later after this life. 3. It inspired me – chapters 8 and 9 looked at profiles of people who were obsessed with God and it shared stories of real life people who gave God their all. The stories of famous and not so famous people inspired to live a sold out life for God. I was in tears at their stories and commitment to God and their obedience to the call on their lives. 4. It left me wondering – the final chapter The Crux of the Matter left me wondering what to do next. It reminded me afresh that we all have to give account to God for our lives, including me! I will stand before God one day and let Him know what I did with my knowledge of Jesus. Did I love God with all of my heart? Did I love my neighbour? Did I make disciples? Did I help the poor? How did I spend my time? For me, this book is a call to action. It is a call to make sure I am living the life God created me for. It is a call to throw off all the shackles and worldly ways and wholeheartedly follow my Lord and Saviour. I would encourage you to read or listen to this book. But a word of caution – don’t do it if you don’t want to be reminded of God’s great love, be convicted of lukewarm areas in your life, be inspired to greater things or challenged to live life in greater service to God. You can find it here on Koorong if you are interested. I have added a new Bible reading plan to my main website today. It is called, “The Essential Jesus”. It contains 100 Bible readings from both the Old and New Testaments. If you are interested you can find it on this page or the direct link here. How could our eating change the world? I just wanted to share a discipleship Bible study booklet I wrote a few years ago. I wrote this because in my ministry work a lot of people were coming to Christ and I wanted to give them a good foundation to begin on. This simple booklet was designed to take people through one on one or in a small group. It has 10 studies using Bible verses that look at assurance of salvation, the Bible, prayer, church, serving God, sharing your faith, Jesus, the Holy Spirit and what God wants you to do with your life. I have taken indiduals through it, small groups and preached it in church as a series. Although a lot of people have downloaded it from my website and used it alone, it works best when you can take people through and answer questions they may have. If you are interested you can find it here for free. Nutritionfacts.org is a great resource for information about nutrition and the way it interacts with sickness and disease. In this video it talks about the crucial role diet plays in Rheumatoid Arthritis and how is can lessen symptoms. This is something that I have experienced in my own life. Michael Greger is an American physician, author, and professional speaker on public health issues, particularly the benefits of a whole-food, plant-based diet and the harms of eating animal products. He is a vegan and the creator of NutritionFacts.org. Hello all, our sermon is now online. The title was “Being a Jesus focused Christian”. Today we looked at three passages about being Christ focused Christians. We saw many truths about Christ – who He is and what He has done. So, let us be Christ focused Christians. Let us be a Christ focused church. You can find the full text here, or the audio here. Believed and accepted. Two key words for salvation. We need to believe that Jesus is the Son of God, that He died on the cross to pay the price for our sin and He rose to life again. Then we need to accept Him as our Lord and Saviour. This means He is our King and Ruler and we follow Him. When we do these two things, we have the right to become God’s children. We are adopted into His eternal family. We live our lives now for Christ and when we die we spend eternity with God. If you would like to believe in and accpet Christ now, you can pray this prayer. Dear Lord Jesus, I want to believe and accept You now. I believe You are the Son of God. I believe You died on the cross to pay the price for my sin. Please forgive my sin. Right now I accept You as my Lord and Saviour. I want You to be my ruler and king. I give the rest of my life to You today. Please help me to live for you from this day forward. Amen. If you have just prayed this prayer, you are now right with God. Your sins are forgiven and Jesus is your Lord, Saviour and King. I would encourage you to visit my “new Christians” page to find some resources to help you in your new life in Christ. You can find it here.